22 Mar What the.. rainfall. When the Bureau of Meteorology (BOM) say their forecast accuracy at this time of the year is poor they aren’t kidding. Just a fortnight ago I was lamenting the poor rainfall forecast issued by the BOM in late February and just yesterday they issued a complete turnaround. Too bad it hasn’t flowed through to cattle market prices yet. The April to June forecast shows a 50/50 chance of rainfall exceeding the median from April to June for most of the country, which is a pretty good outlook considering just a fortnight ago half of the country had a less than 20-30% chance of exceeding the median – Figure 1. Indeed, the only significant regions not likely to see rain is the far northern tip of Queensland and that’s a good thing given the recent soaking there. Unfortunately, the extended dry conditions and the dire outlook from a fortnight ago saw many producers in Queensland and NSW offload cattle, such that East coast yardings have remained elevated for the last few weeks – Figure 2. Since the start of March average weekly cattle yarding levels have been 33% higher than the five-year average pattern across the East coast. A breakdown across the Eastern states shows that in Queensland weekly yarding levels have been trending above average all season. The average yarding level in Queensland has been 46% higher than the five-year pattern since the start of 2019, but since the start of March this has jumped to 67% above the five-year average. In NSW cattle throughput has been trending 12% above the five-year average pattern since the start of the year. However, since the beginning of March this has lifted to 50% above the average seasonal trend. Victoria has been bucking the trend, with cattle yarding levels 23% below the five-year average since the start of 2019 and average weekly levels in Victoria since March haven’t been dissimilar at 24% below the long-term seasonal trend. 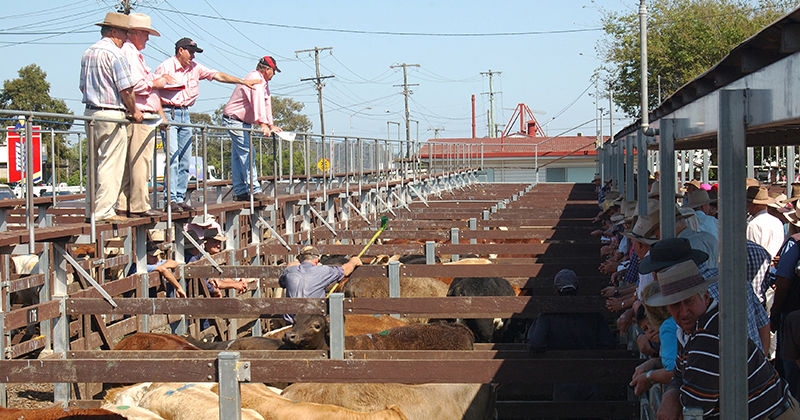 The supply of younger cattle in the northern saleyards has seen the Eastern Young Cattle Indicator (EYCI) slide to lows not seen since 2014 and has closed the week at 393¢/kg cwt. We are at crucial support levels now for the EYCI and after registering a mid-week low towards 385¢ managed to see price climb back towards 400¢ in the final days of the week. In a further sign of optimism Trade, Medium and Heavy Steers along the East coast all managed a price gain this week to see them rally between 15-30¢/kg. Gains were also noted for the Western Young Cattle Indicator (WYCI) and the 90CL frozen cow export price, up 5% and 2% on the week – respectively (Figure 3). The spread discount of the EYCI to the 90CL is now in excess of 260¢/kg cwt and is beyond levels that would be considered historically extreme. Indeed, the only time we saw the spread discount extend beyond these levels was during the depths of the 2014/15 drought and it only lasted there for a short time. Given the updated BOM outlook for rainfall, the fact that we are at crucial support levels for the EYCI, and that the 90CL is continuing to hold firm I can’t help but think that we are at the bottom of the current cycle for the EYCI right now. As the BOM forecast shows we can always be wrong… but I’ll eat my hat if the EYCI keeps dropping in the next few weeks.